The V&A’s Mughal embroidered coat is well known as one of the finest surviving examples of Indian court dress, and has been frequently displayed and published since the Museum acquired it in 1947. 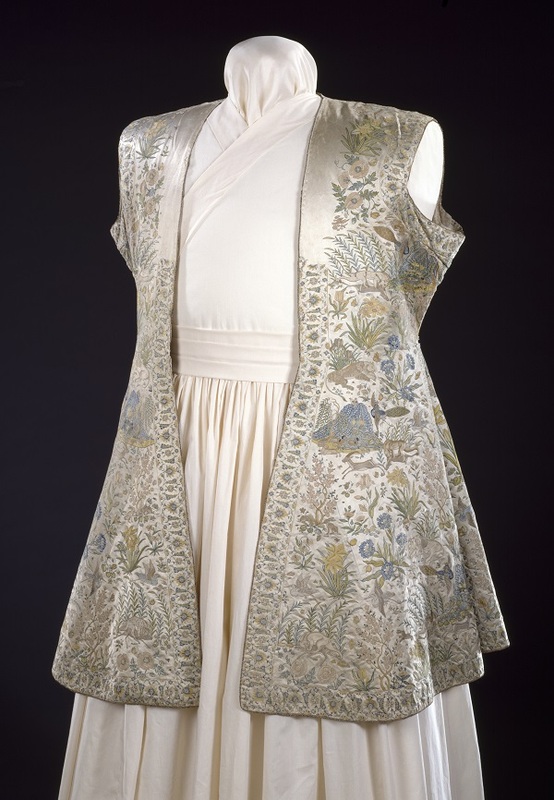 But in spite of its superb quality, the coat was rejected for acquisition by V&A curators not once, but twice. 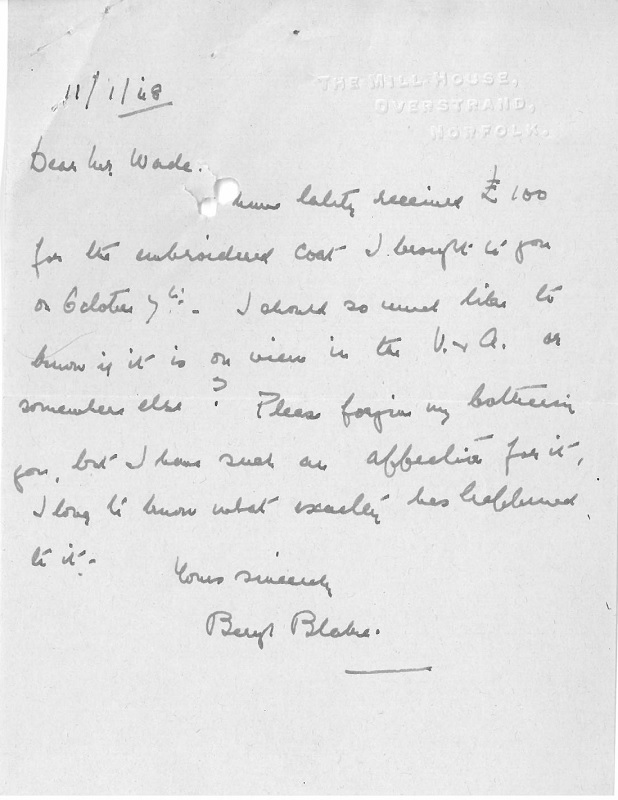 Undeterred, a year later (14 November 1930) Mrs Blake contacted Wace again. 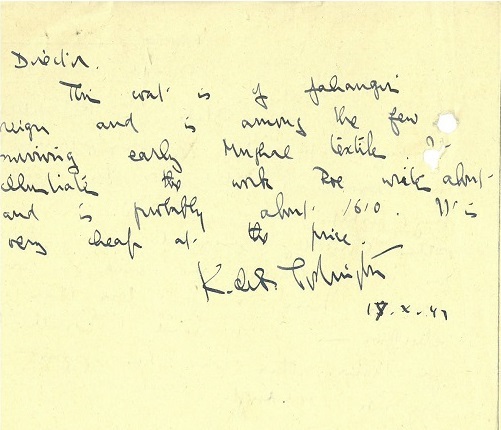 She had heard that there was to be a great exhibition of Persian art (which took place at Burlington House in 1931) and once again sent the coat to the V&A with a note saying ‘Here is my Persian coat. 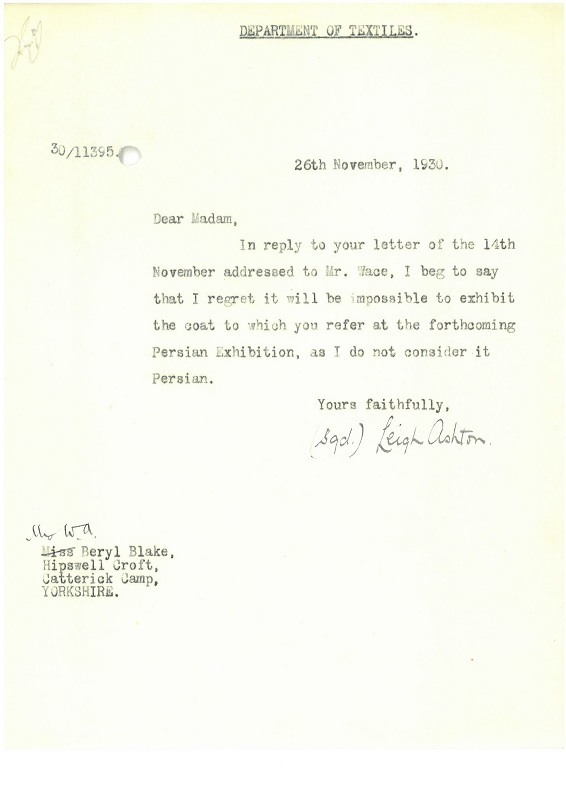 It will be very interesting for me if it is exhibited at the Persian Exhibition as I shall then learn more about its history.’ This time the reply came from Leigh Ashton of the Textiles Department (later Sir Leigh Ashton, Director of the V&A 1945-55). 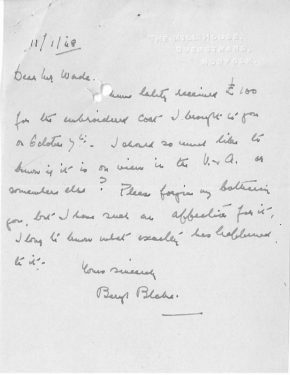 In another rather terse letter, Mrs Blake is told ‘I regret it will be impossible to exhibit the coat to which you refer at the forthcoming Persian Exhibition, as I do not consider it Persian.’ There is no suggestion that it might be usefully offered to the V&A’s Indian collection instead. 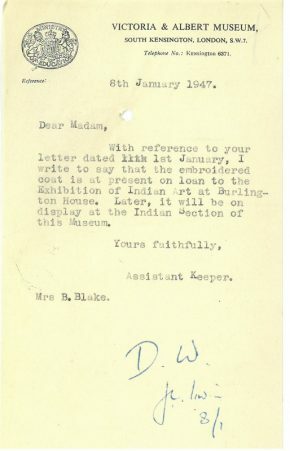 The landmark exhibition ‘The Art of India and Pakistan,’ directed by Leigh Ashton (who had rejected the coat 17 years earlier), was held to mark India’s Independence and the creation of Pakistan in 1947. 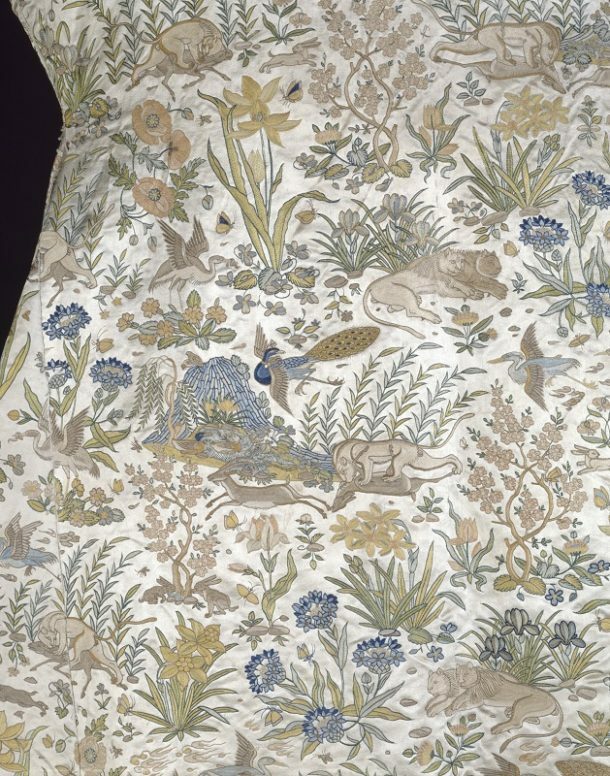 The embroidered coat was one of the textiles selected for illustration in the catalogue, and this was its first public appearance. Since then, it has been shown in several other major exhibitions on Mughal art, and is one of our most cherished objects. It will of course be on display in The Fabric of India and we are still learning more about it. Reading the story of its acquisition in the file is a sobering experience. 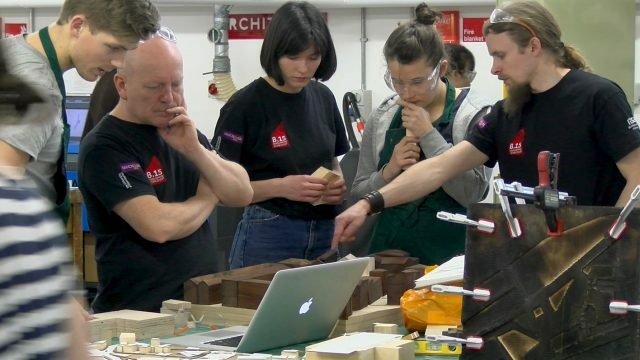 It reminds us as curators of the value of discussing objects with colleagues in other fields to one’s own – something which we are fortunate to be able to do easily at the V&A. 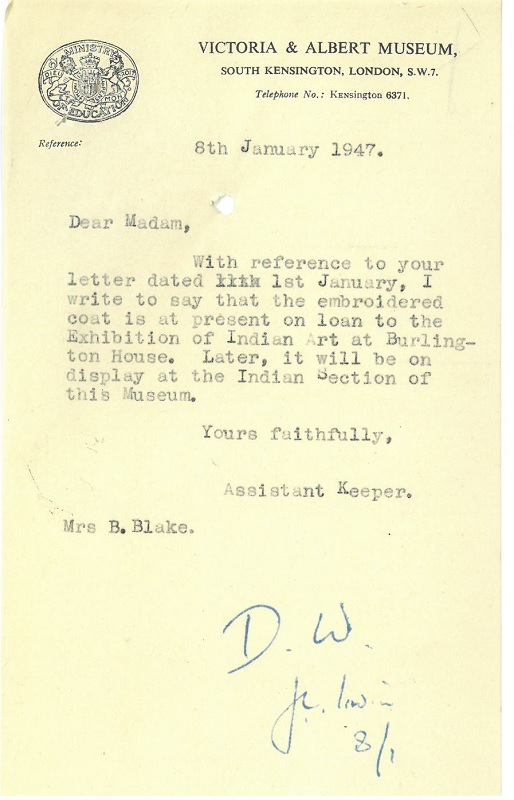 Reading Mrs Blake’s letters also brings out in a most poignant way the fact that many museum objects come to us from individuals who are offering their most beloved possessions – and we should be grateful to them for doing so. 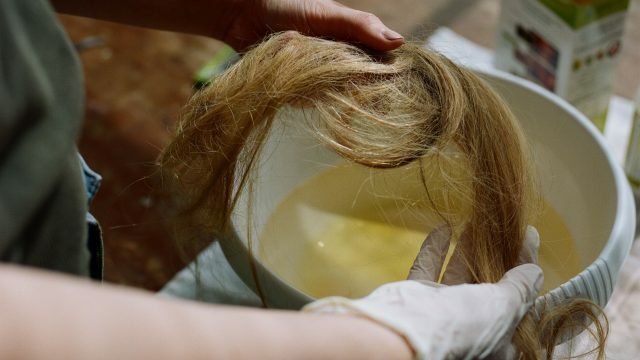 I want to thank you for sharing this piece of your organization’s history! 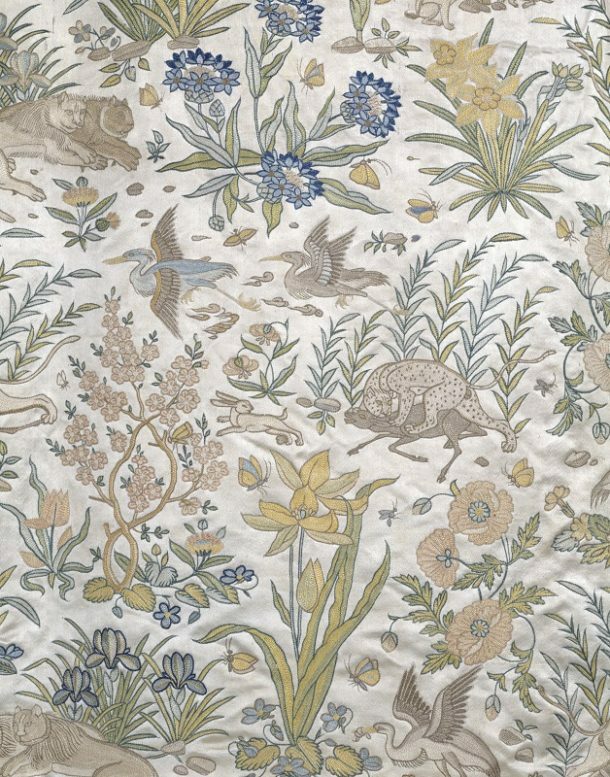 First because both historical fashion and Mughal design & decor are of such an interest to me, and because it’s frank in its assessment of the way employees have carried themselves when dealing with art acquisitions. I hate to use the word snobby, but it seems fitting for situations such as these, and too often have I been in contact with curators who turn their nose up and miss out on opportunities to truly appreciate great art. Anyone with eyes can see this is an absolute stunning piece! 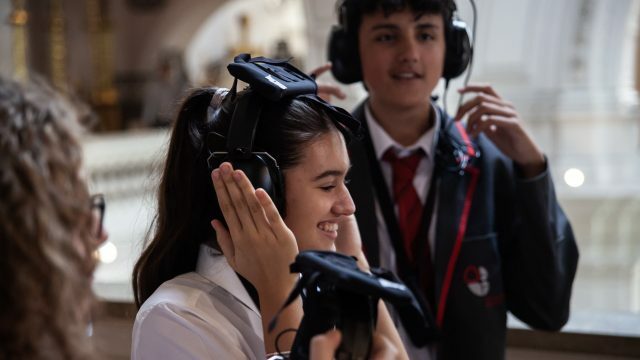 The way in which Mrs. Blake was treated is discouraging, but what is uplifting is the acknowledgement of that fact and growth from learning it’s not the way to treat art and people who care about art!